Products including but not limited to granite titles, slabs of 300 X 180 cm up can be produced. We are skilful in most proccessing technique and experenced to produce customized granite products. Standard size tiles have ready stock for prompt delivery. Large and Small blocks as well as various sizes of slabs for Granite can be ordered. Our quality stones, skill workmanship, advanced machines together with excellent service, in-depth mining and fine processing capabilities and plus the never compromising quality attitude, all contributes to our success in the granite export business. The company derives its strength from strong orientation towards quality management practice in the plant. Standardized practice is implemented to deliver quality product to our customers. The company has designed calibrated standard for quality assurance. Besides SDC has good experience in handling customized orders from its customers. The flexible manufacturing system we employed enables us accommodate even the most demanding customers. The flexible manufacturing system we employed enables us to accommodate even the most demanding customers. Our quarry and production plant can guarantee you in both volume quantity and stable quality. Advanced and modernized equipment is imported from Italy and Taiwan to cater for precise cutting and fine polishing. These make us different and unique in China Stone distribution. We are familiar with custom design manufacturing. With thorough knowledge of the different technical terminology acquired over time. We are comfortable to work to your requirement. We are skillful for producing varies granite products with different kind of edges, like EASED, BEVEL, DOUBLE BEVEL, BULLNOSE, SEMI BULLNOSE (HALF BULLNOSE), FULL BULLNOSE, DUPONT, MITER OGEE, OGEE BULLNOSE, DOUBLE DUPONT, DUPONT BULLNOSE, QUIRKE, DOUBLE DUPONT, OFFSET DUPONT, BULLNOSE/INVERTED OGEE, WATERFALL, ROCKFACE, RADIUS TOP/BOTTOM, FLAT STANDARD, RADIUS TOP and MITERED. 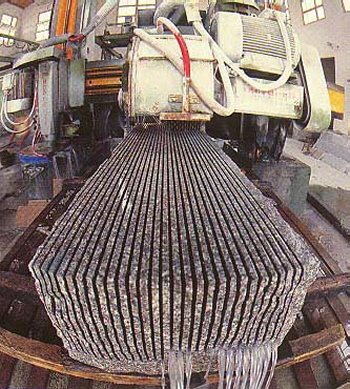 CLEFT finish (hewn, cleaving or rough), ROUGH PUNCHED (rough hewn, BS435 class C), FAIR PICKED (intermediate stage of production between rough and fine picked), FINE PICKING (Bush-Hammering or Dolly pointing), SAWN, FLAME TEXTURING, POLISHING, HONING (dull, matt finish), CHAMFERS (Rounding) and RIVEN finish.